How do I get the training process started? Do I really need 5 lessons? Is an assessment required before I can book any training? Which program is the right one for me and my dog? My dog has specific training needs. Can you customize your programs? What is the age range of the dogs in your puppy pre-school program? We offer private lessons only. This is based on our philosophy that dog obedience training is most successful when it is conducted in one-on-one sessions. This setting allows the trainer and the dog to focus their complete attention on the specific training needs of that dog. We have trained all breeds of dogs. You would be hard-pressed to find a breed that we have not trained – from Chihuahua to Great Dane, big or small, we train them all! At Alpha Paws we train dogs the way a mother wolf would train her pups in the wild, using love and respect instead of food as motivation. No, your dog can be trained at any age provided that you, the owner, are willing to learn too. The first step is to book a home visit for your family and your dog to meet with an Alpha Paws trainer. This will give us a chance to meet you and your dog in the dog’s natural environment and better assess its training needs. It will also give you an opportunity to meet us and get a better understanding of the Alpha Paws philosophy and our training methods. This evaluation usually takes about one hour and can be scheduled on any day (weekdays or weekends) between 9:00 a.m. and 7:00 p.m. This depends on the type of training program. Private lessons are sold in blocks of 5 one-hour sessions, scheduled once per week for a period of 5 weeks. This scheduling provides the time and opportunity for the dog and its owner(s) to practice the techniques taught and learned in each session – this is highly recommended as part of the training process. Our Board and Train programs include 10 consecutive days and nights of training for the dog with an Alpha Paws trainer. Once the dog returns home, there are 5 follow-up lessons for the dog owner to learn (a) what their dog has been taught and (b) how to maintain and reinforce the training. These follow-up lessons are typically scheduled one per week. Yes! It would be almost impossible to learn, assimilate, and practice each of the commands and elements of our Alpha Paws training in just a single follow-up session – not to mention extremely exhausting for you and your dog. Our experience has shown that most owners require at least 5 lessons to become comfortable with and fluent in the training/communication process. Alpha Paws will guarantee that the dog will never revert to its previous behaviours – on the condition that the dog owner follows the training methods learned at Alpha Paws. Yes, the assessment is required before any of our training programs can begin because it is the best way for the Alpha Paws trainer to determine the needs of the individual dog-family team and subsequently build the appropriate program. Whenever you are ready! Schedule permitting, we are available to conduct an assessment at your home Monday through Sunday between 9:00 a.m. and 7:00 p.m. Just contact us at 905-830-9500 or toll-free at 1-877-868-PAWS or e-mail us at info@alphapaws.com to book a convenient time. We offer three different programs, designed to suit every lifestyle. If you have the time and the inclination, Private Lessons is a good option. If your dog displays problems with housebreaking or aggression, the 10-day Board and Train program would be your best choice. In addition, if you are going on vacation or need to board your dog for an extended period of time, then the Board and Train program fits best, as you can have your dog trained while you are away! If you want your dog to receive intensive training by a professional but do not want the dog to be away overnight, the 10-day Drop Off program might be most appealing. Alpha Paws was established by Peter Brown in January 2001. Peter has been training dogs to ‘mind their manners’ for more than 20 years. 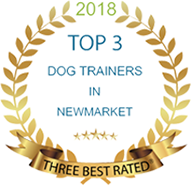 With extensive training and experience in various fields of animal care, from nutrition to obedience, Peter is an extremely competent and qualified teacher to work with you and your dog. Yes, this is one of the key benefits to choosing Alpha Paws for your dog obedience training. Every dog is viewed as an individual and therefore as having their own individual challenges and needs. All of our programs cover the core elements of manners, communication, and respect, as well as the basic commands (including sit, stay, come, go back, etc.). In addition to these fundamentals, each program is also customized to address the specific needs and behaviours of your dog. The minimum age for dogs to begin any of our obedience training programs is four months. Puppies are welcome to register in our puppy pre-school program when they are between the ages of 9 weeks and 16 weeks – roughly anytime in the first two to four months of life. "Peter, Our Logan is so much fun since his training. He doesn’t jump or bite anymore and we get so many compliments on how good he is.Thanks again Peter..."